It’s as good as the Original! I felt there was something strange when I began teaching short courses for credit based in Venice for the University of California at Berkeley. Something was missing, but I wasn’t quite sure what. Of course, one couldn’t stroke the original bronze Horses of St. Mark’s Cathedral and stand beside them to survey the square, the bell tower and the figure that strikes the hours over the opening that leads along small alleys to the Rialto Bridge. , as I did as a student. I have a special affinity with the horses. I once translated a catalogue from Italian for a London exhibition with one of the original bronze horses. No, the real absence I missed was of Paolo Veronese. ‘It’s as good as the original!’ I was standing in the deserted refectory of the monastery behind the church of San Giorgio Maggiore, now a resplendent conference and study centre. 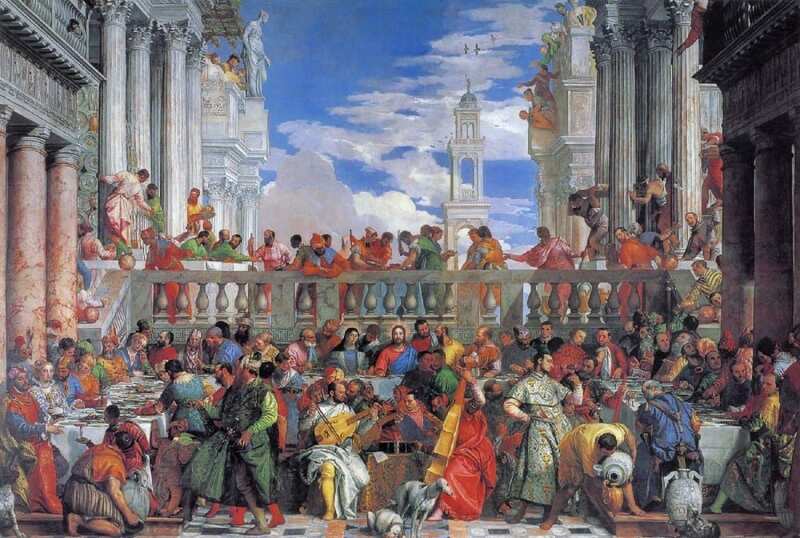 There before me, covering the wall behind the high table of the Abbott, who would have looked down the long ones before him with all the monks, was Paolo Veronese’s The Marriage at Cana, painted in situ and completed in 1563. The latest laser techniques had reproduced the original, now in the Louvre, Paris, with such exactness that even the places where the French soldiers had cut when it was looted in 1797 to the order of Napoleon were copied! Rather pointless, I thought. Our host was praising the work. ‘Why not offer it to the Louvre in exchange for the original?’ I asked. A horrified look. So be it. Thanks to Napoleon and modern technology, Paolo Veronese and his helpers have been cleaned out of the refectory. Why should it matter?